About Hazards in the Electronics Industry | Stop Samsung - No More Deaths! 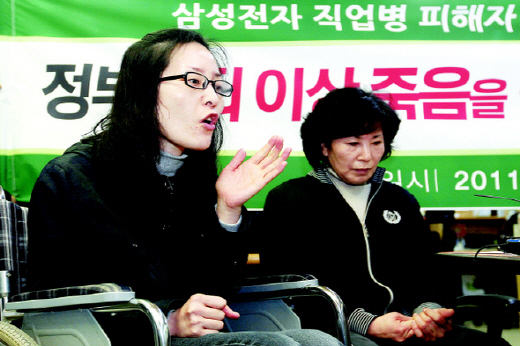 Four victims of occupational disease in Samsung Electronics plants including Han filed an administrative lawsuit against the Korea Workers’ Compensation & Welfare Service (KComWel) as the KComWel rejected their request for medical treatment due to industrial accidents. On that day, Banollim, a civic organization for semiconductor plant workers’ health and human rights, released a report detailing the rate of occupational disease for employees of Samsung Electronics and Samsung Electro-Mechanics. According to the report, of the 120 workers who notified the organization of their disease since November of 2007, 56 reported contracting cancer of the blood forming system such as leukemia. Brain tumor accounted for eight, followed by aplastic anemia at 6, breast cancer at 5 and skin cancer at 4.